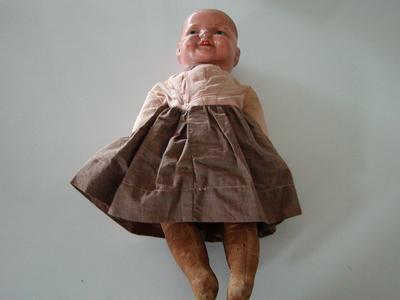 I found this doll in my mothers belongings after she passed away. It is obviously old and I have tried to find others like it on ebay with negative results. It has a cloth body stuffed, feels like straw, and the original cloths. I could not find any markings on the body. I am not sure what the head and hands are made of so it was difficult to search for one's like it. I would deeply appreciate any help and information.